This past weekend Ryan and I did photography for the wedding of one of his fellow firefighters. Weddings are exhausting for us. It’s 8 hours of walking, yelling, squating, standing on tiptoes, running between activities, listening to complaining wedding planners, trying to find a sip of water… By the time we get to the reception, we can catch our breath finally and really take a look around. A whole table of firefighters I hadn’t noticed before caught our attention and we went to chat. Ryan’s been a firefighter for 8 years now. In that time, I’ve made countless batches of cookies, cakes (including one that was a complete disaster and they ate it anyway), cupcakes, bars… Any time I ran across a fun dessert recipe, the boys at the station got it. I’m the baking wife. Really though, it was always just an excuse to stop by the station. I never felt right going to just ‘hang out’ where my husband works and lives with other people, but if I went with a sugary purpose, I could eek out a few minutes in a recliner without too much guilt. Next week is Ryan’s last as a firefighter. I suspect he’s a little sad about it (and so am I! it’s been really good for us to have time apart to really appreciate each other), but he’s excited to move on to a new portion of his life. He’ll be going to nursing school! It’s exciting, and I’m excited for him, but who in the world am I going to bake for now? I guess the poor saps at my work will just have to suffer the brunt of the baking from now on. So in this last week and a half of being a firefighter wife, I plan to wear myself out baking. It’s the least I can do for the guys who have been his other family. The ones he spends a third of his life with. Who’ve entertained him with eating contests (he always wins), racquetball games, razzing, wrestling to answer the phone, racing to steal the other guy’s plate as soon as he’s done eating so he doesn’t have to clean it. They’ve been good to him, and a few cookies here and there aren’t enough of a thanks from me. I’m going to miss them almost as much as Ryan will…. 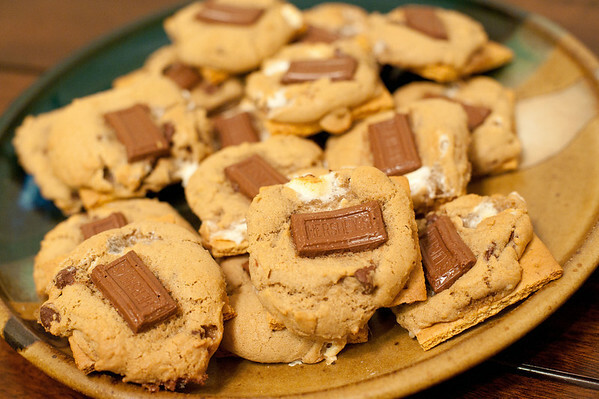 Today the guys at the station are getting S’mores cookies. I made them last week for my own work and they were a total hit. I wasn’t happy w/ them aesthetically (I should have smushed them down more so the cookies covered the whole graham cracker), but taste-wise they’re a home run. The cookie doesn’t taste like a regular chocolate chip cookie. It tastes like a graham cracker! And the browned marshmallow? Yum. The actual graham cracker on the bottom? A super fun added crunch. These may be the first I’ll make for Ryan to take to whatever hospital is lucky enough to hire him when he’s done with school! Update: just made a new batch and instead of scoops of dough, I sort of evenly dropped it all over. I also broke the chocolate bar pieces in half and put them in random places. I then used a pizza cutter to make squares when it cooled. Much prettier! They look less like a cookie slapped onto a graham cracker this way. Preheat the oven to 375 degrees. Line baking pans with parchment paper. 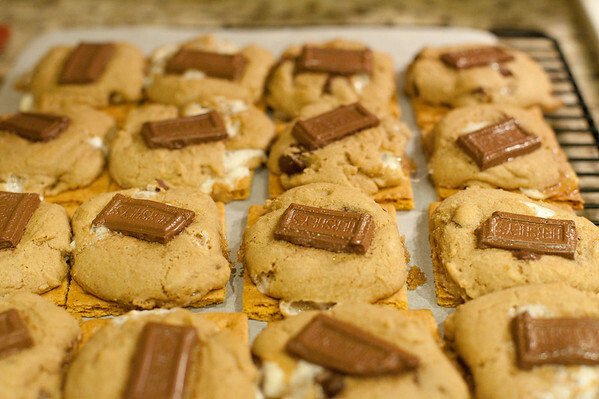 Place tablespoons of dough on graham crackers about 1 – 1 ½ inches apart. Press down slightly with fingertips. 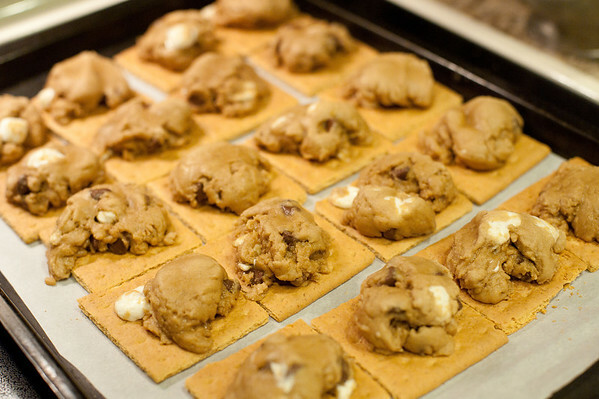 Make sure dough covers the crackers as it won’t melt down too much. This entry was posted in 5 Wine Glasses, Dessert and tagged chocolate, marshmallow. Bookmark the permalink. 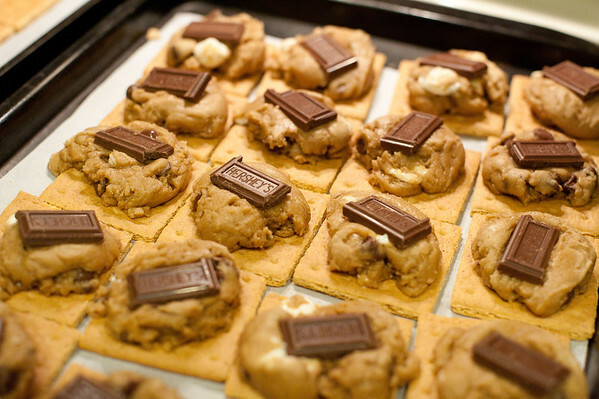 9 Responses to Please sir, can I have S’mores? Hey, I’m the baking wife too! It’s a good thing to be! 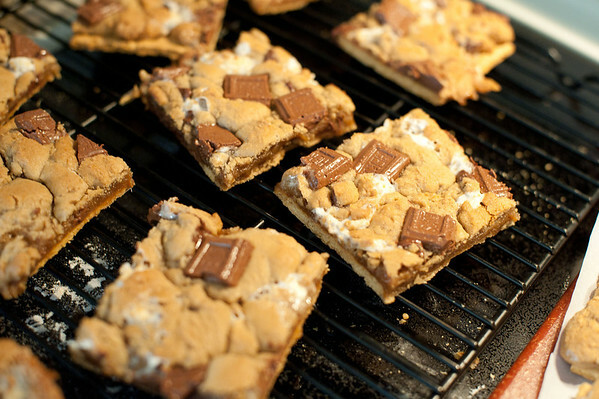 These cookies were so good (even if they looked like a cookie on top of a graham cracker)! Thanks for sharing with us lowly cubicle rats. Thanks, pretty nervous about the whole thing, career change is weird. Is it one cup of granulated sugar? When I went to make these I noticed the amount is missing. Help? Wow! How did I not notice?! Thank you!